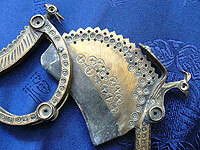 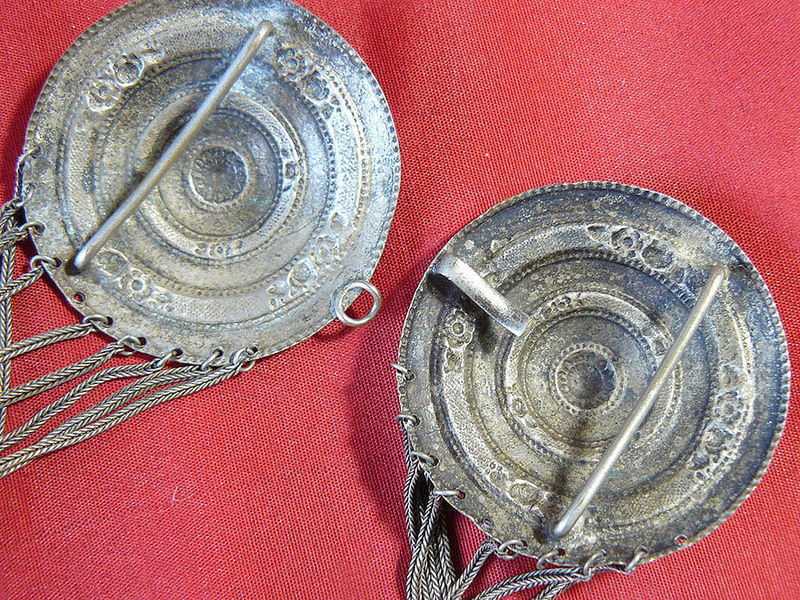 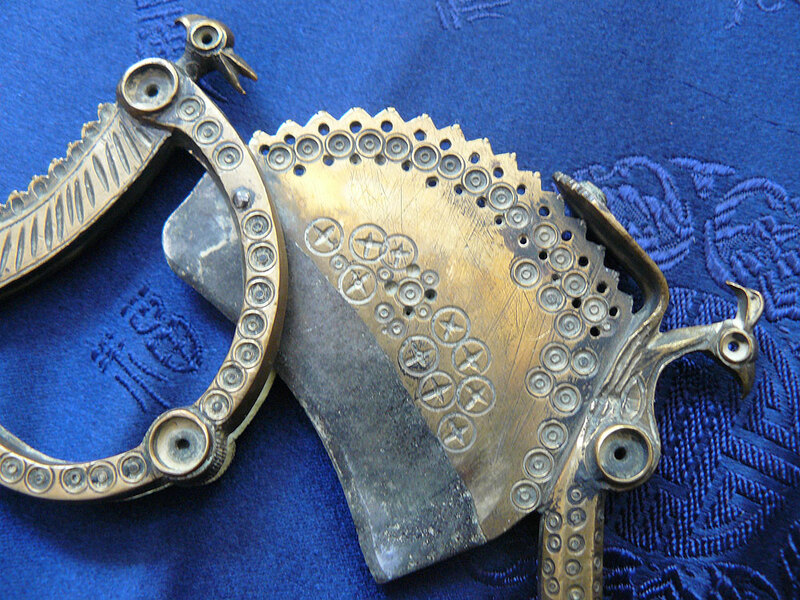 A wonderfull, finely made Central Asian belt buckle. 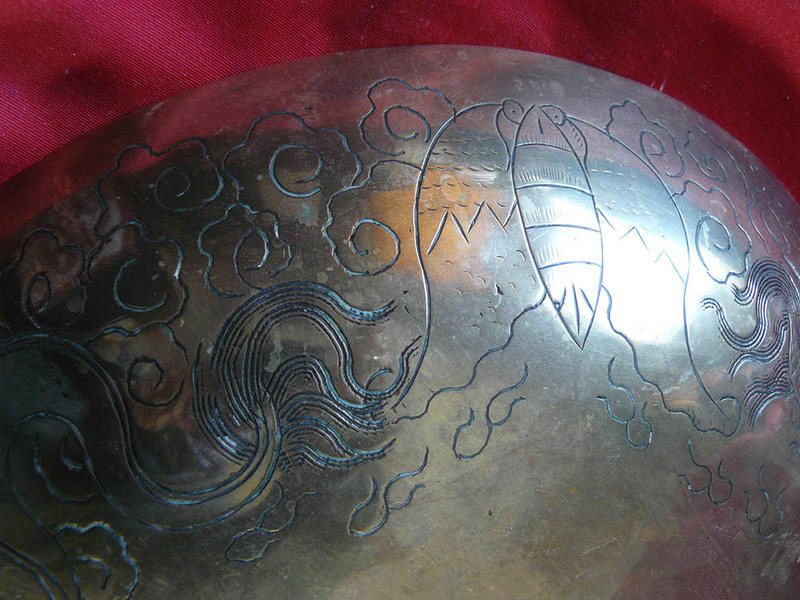 It's exact origin is not know, it could be from Mongolia or Tibet but is probabaly from Central Asia somehwere, possibly Turkman. 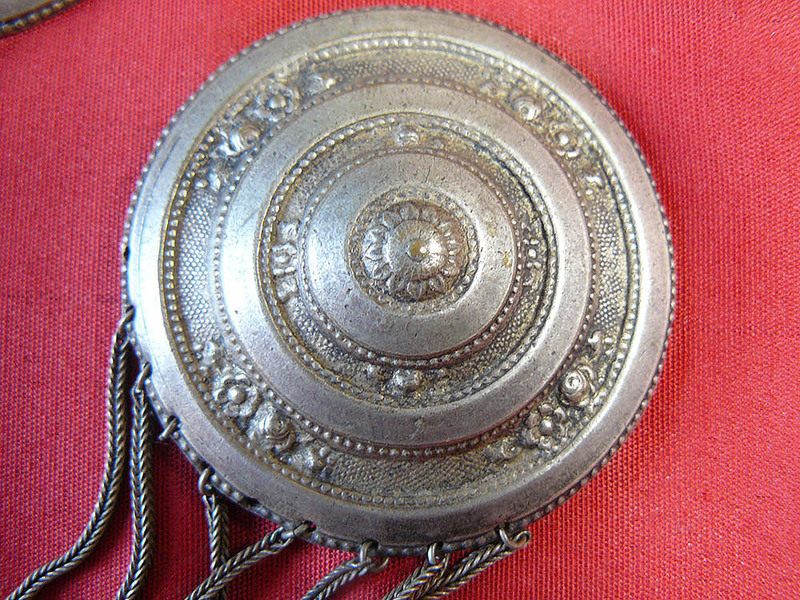 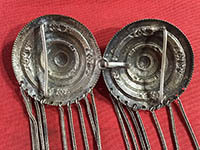 This is almost certainly a woman's buckle and is made in what looks to be pure silver. 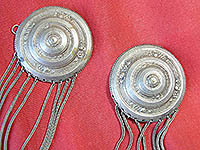 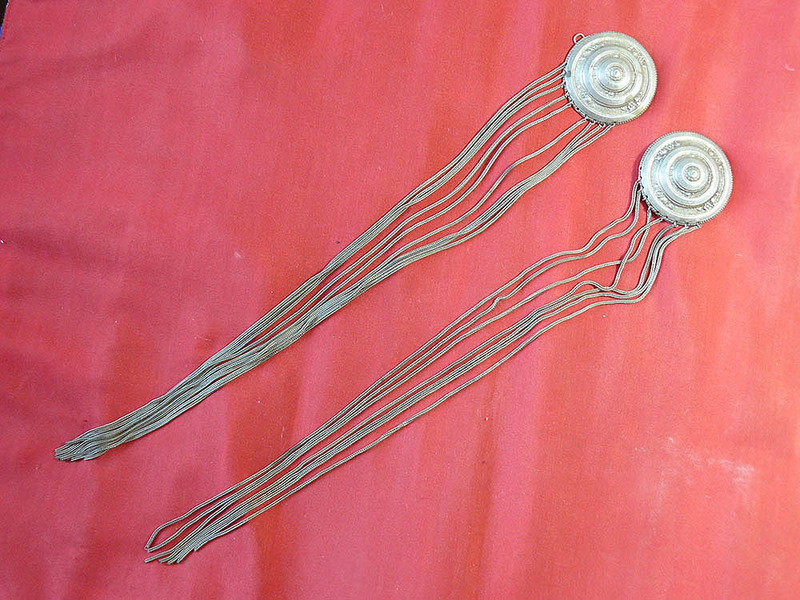 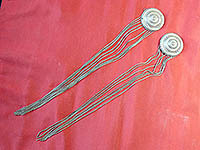 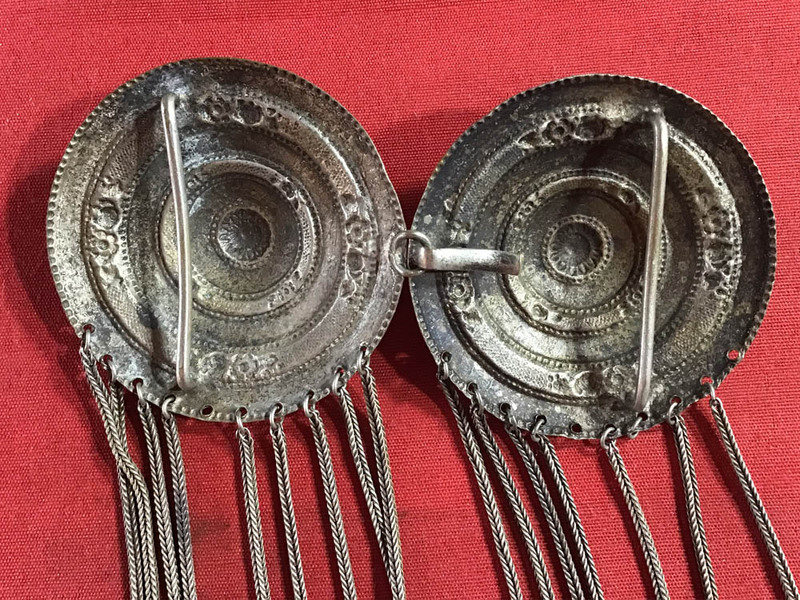 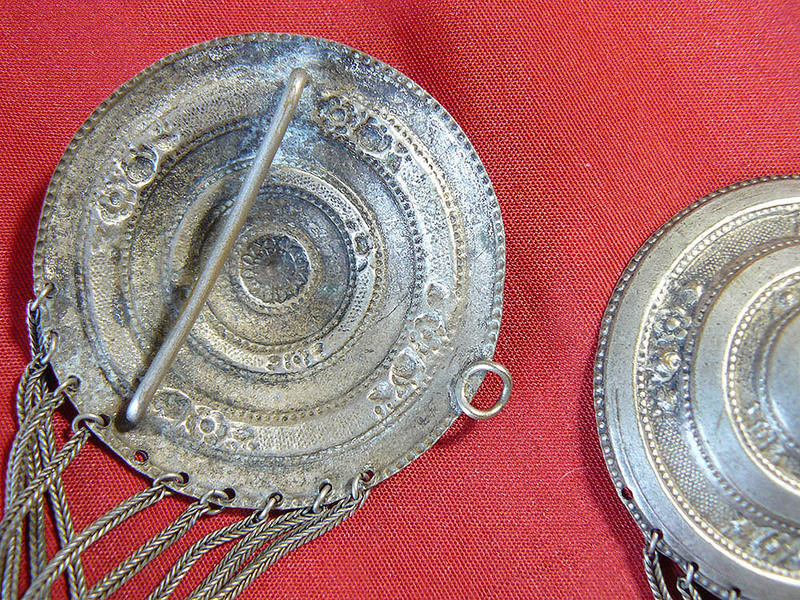 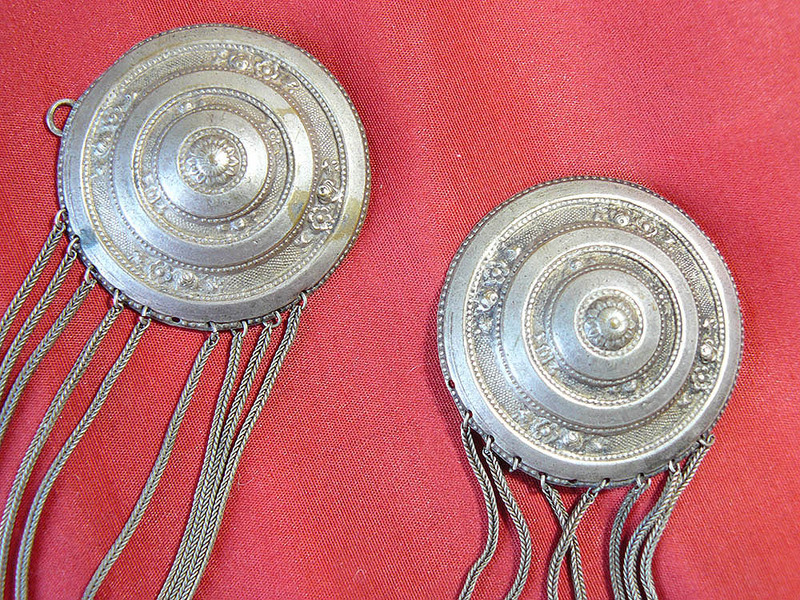 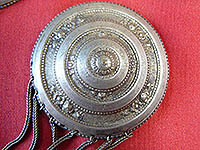 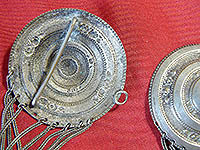 It is very finely made, with heavy silver chain. In generally good condition but some loss to the chain. 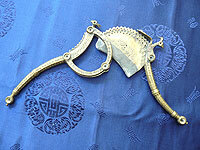 It could easily be used by attaching a leather or cloth belt to the bars at the back of each buckle. 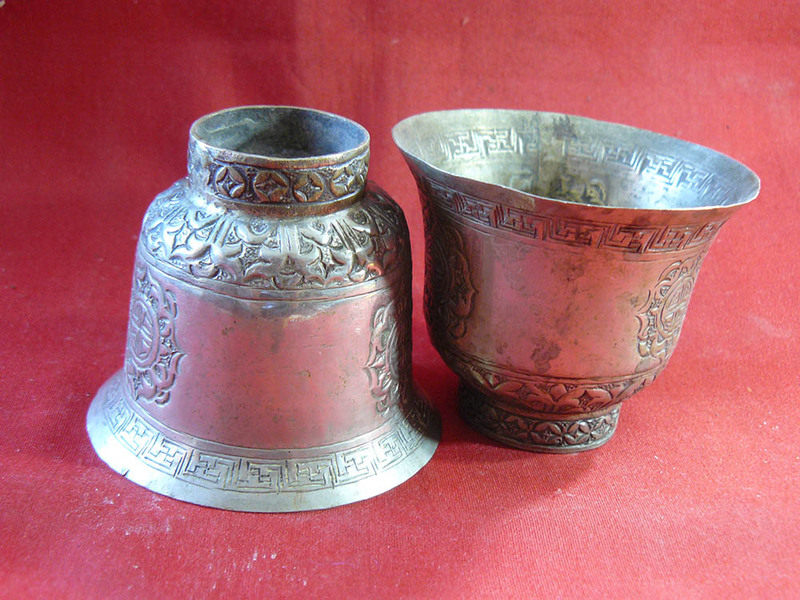 Two old Tibetan cups, both well made and in good condition. 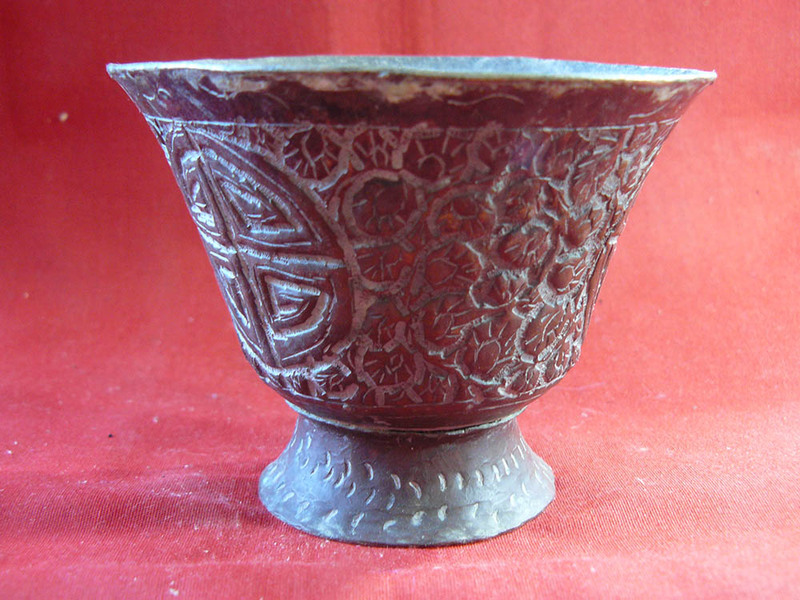 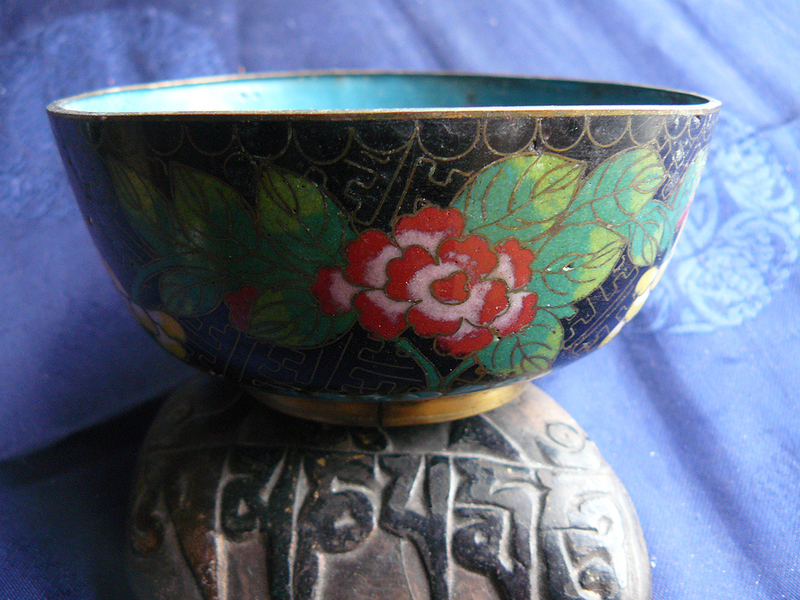 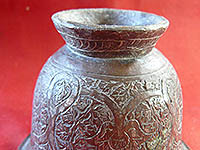 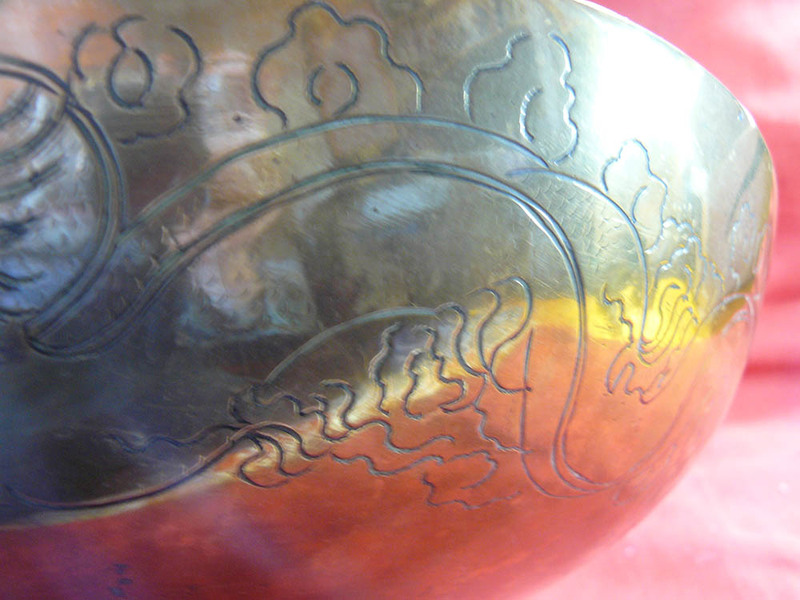 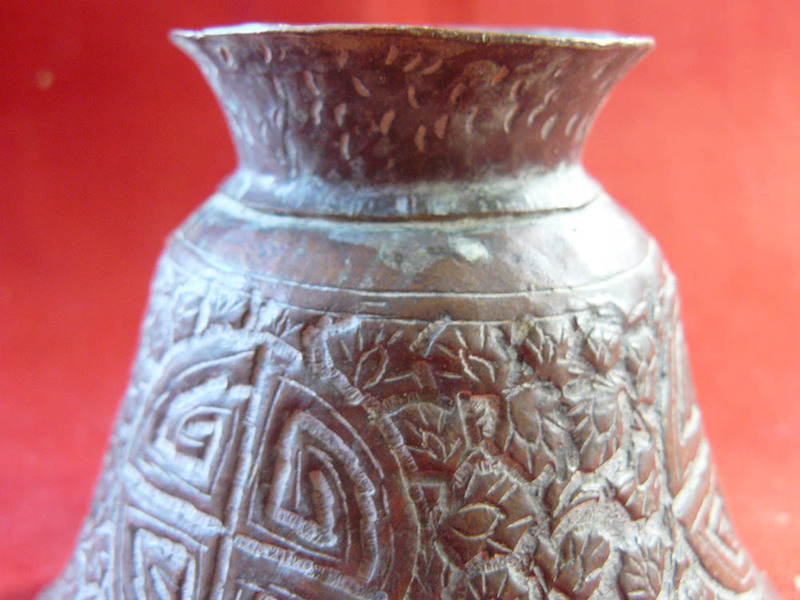 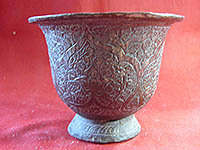 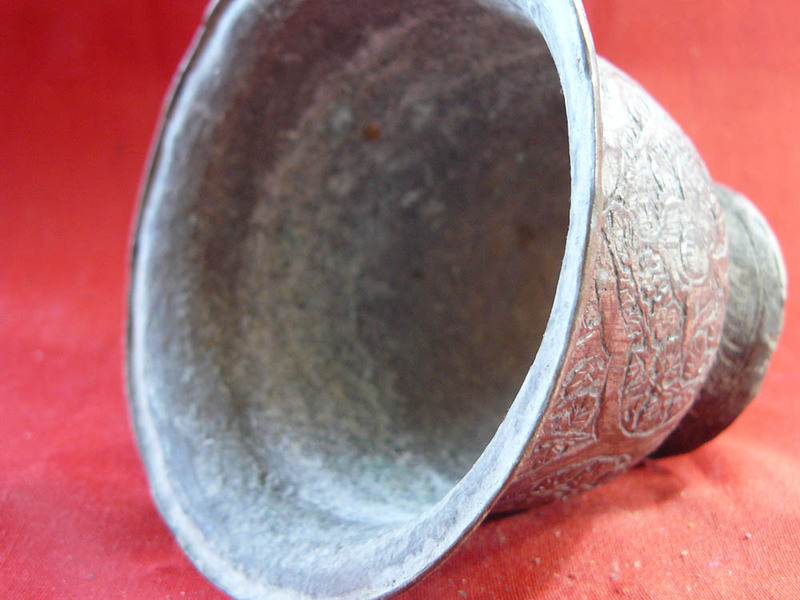 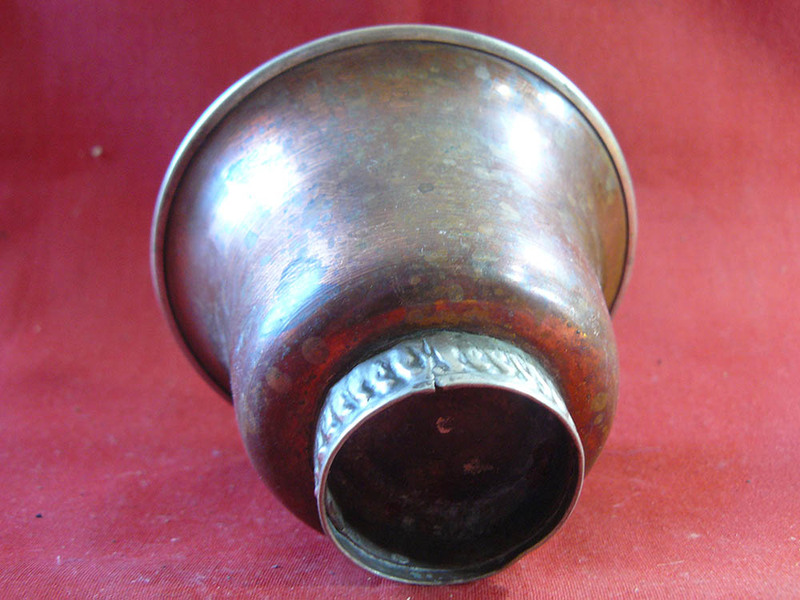 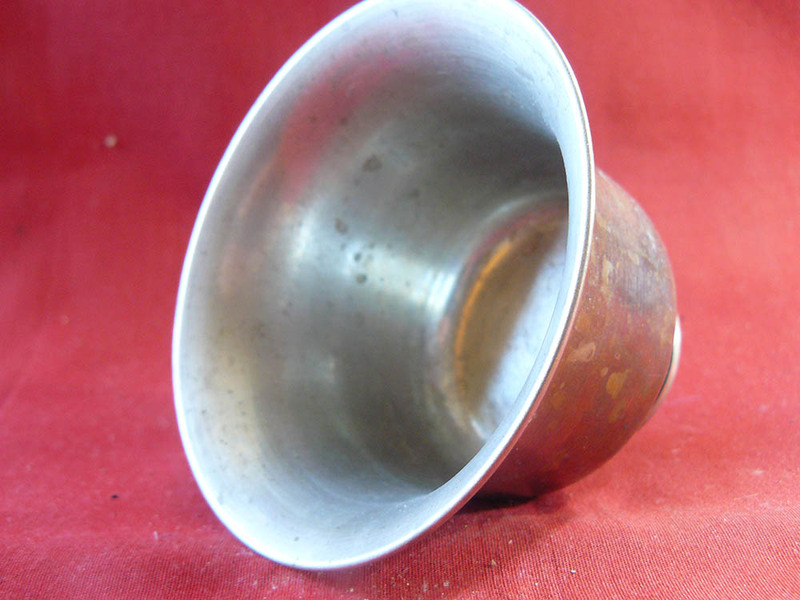 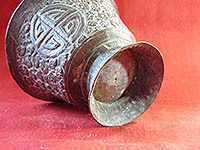 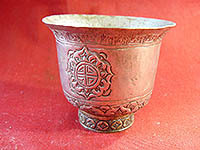 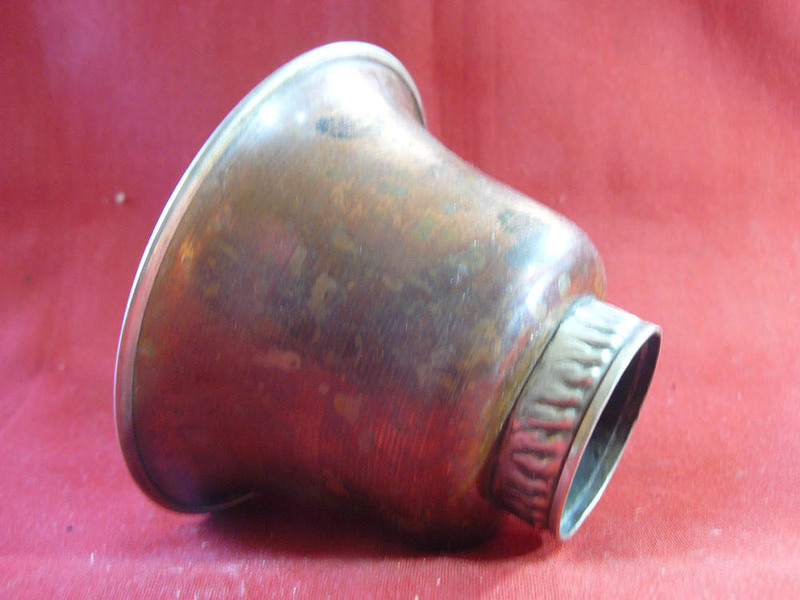 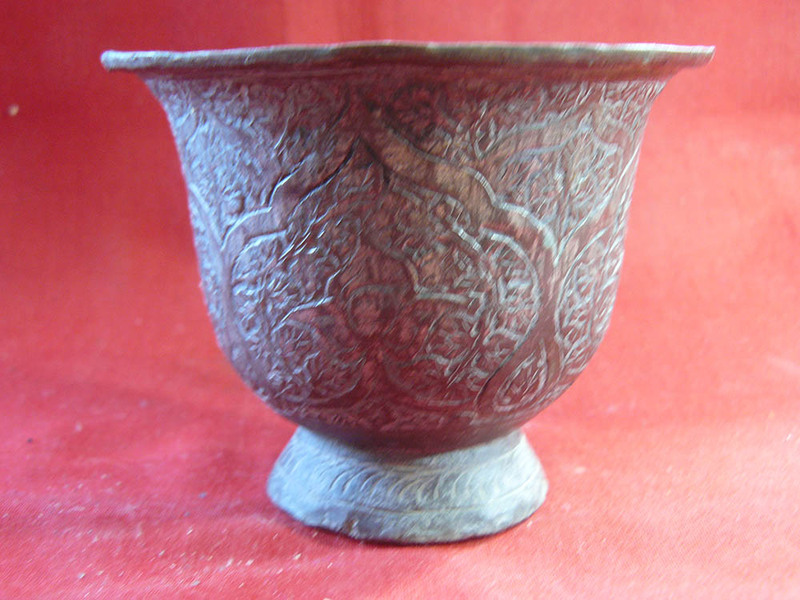 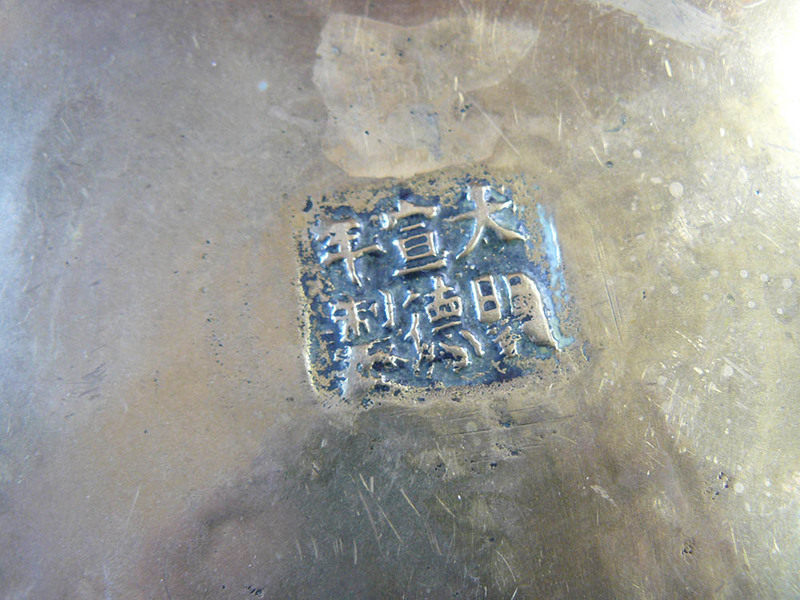 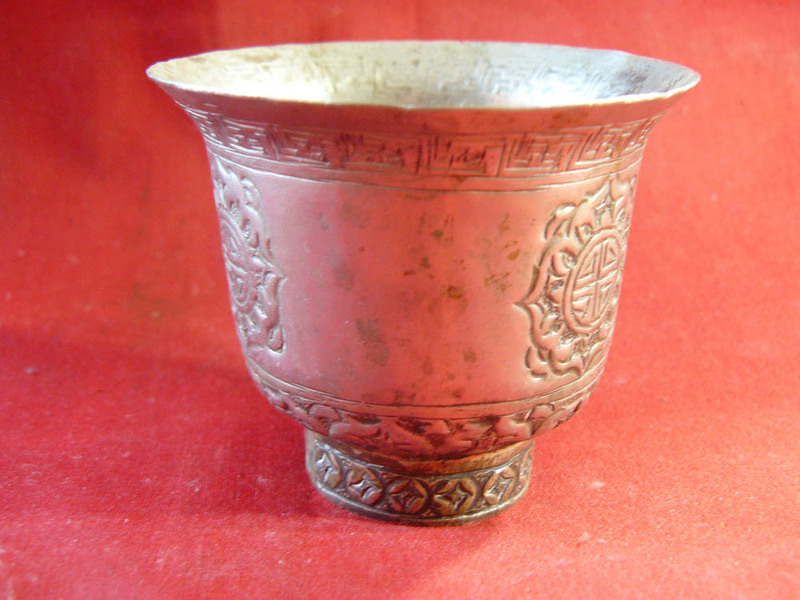 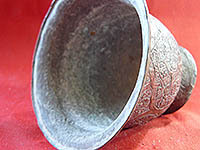 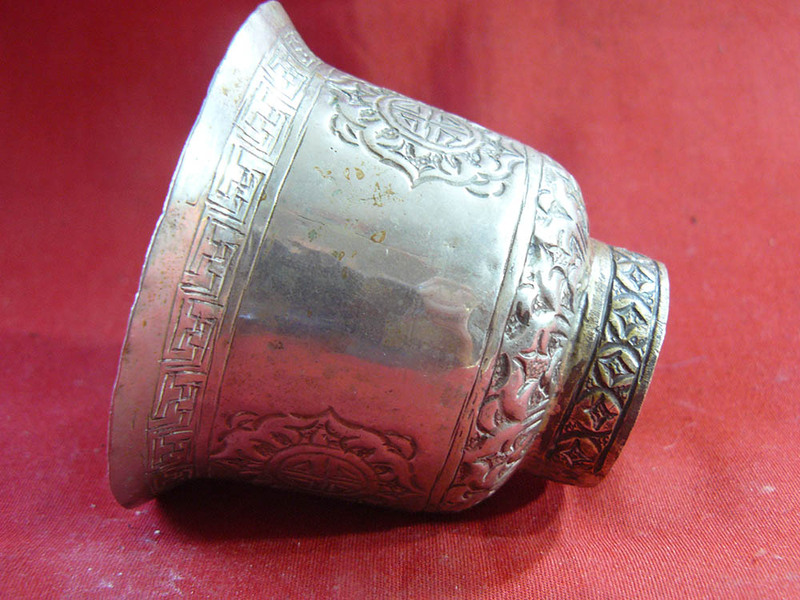 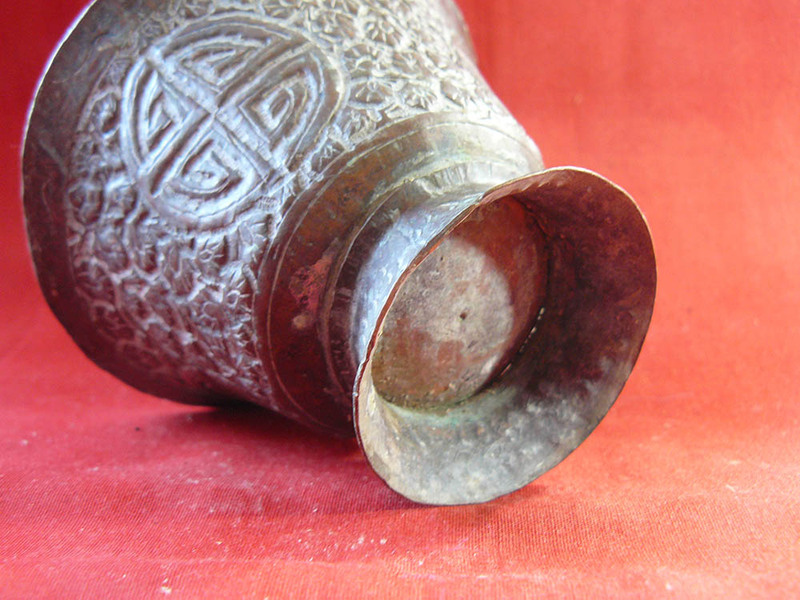 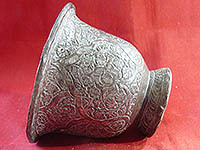 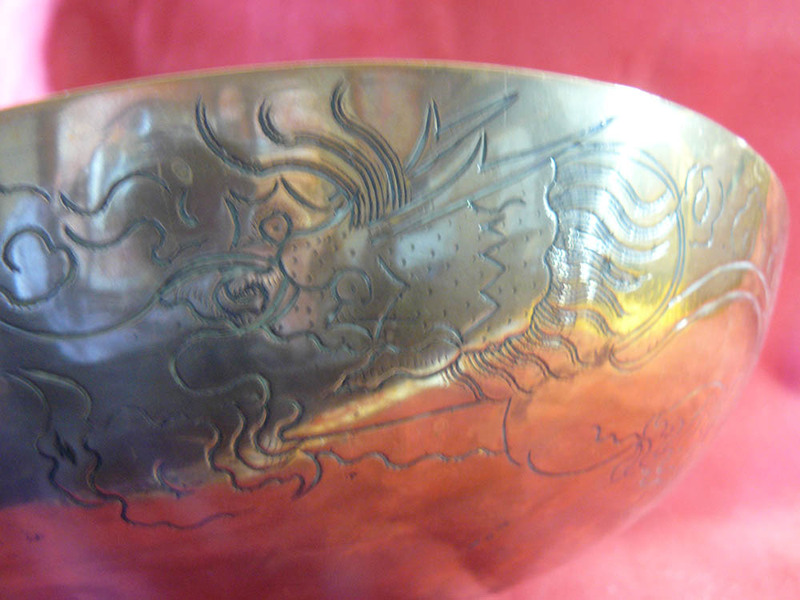 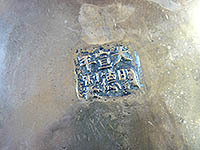 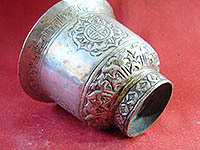 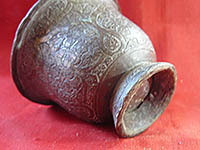 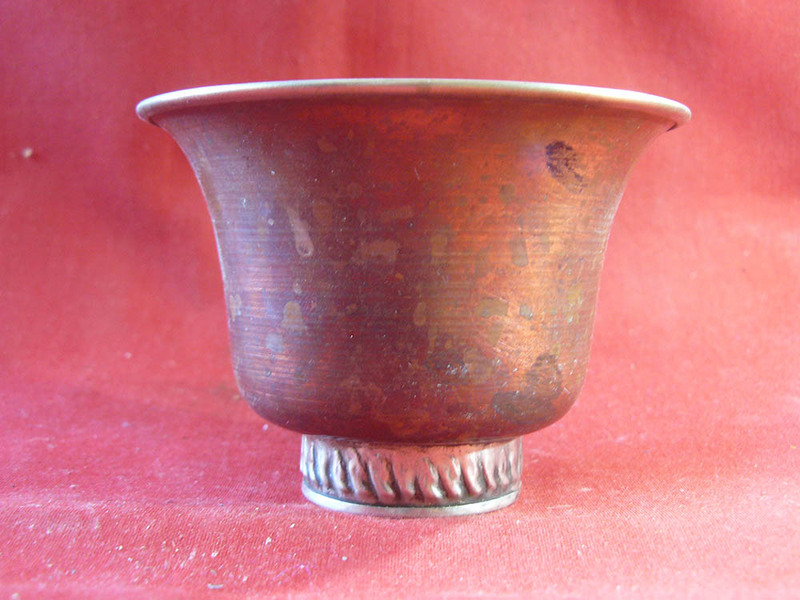 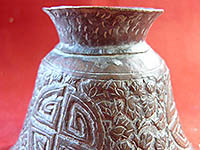 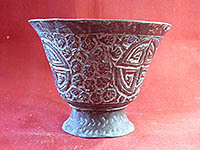 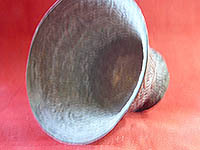 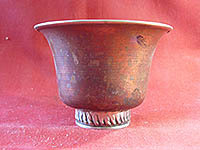 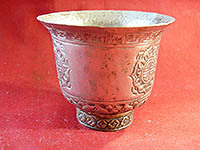 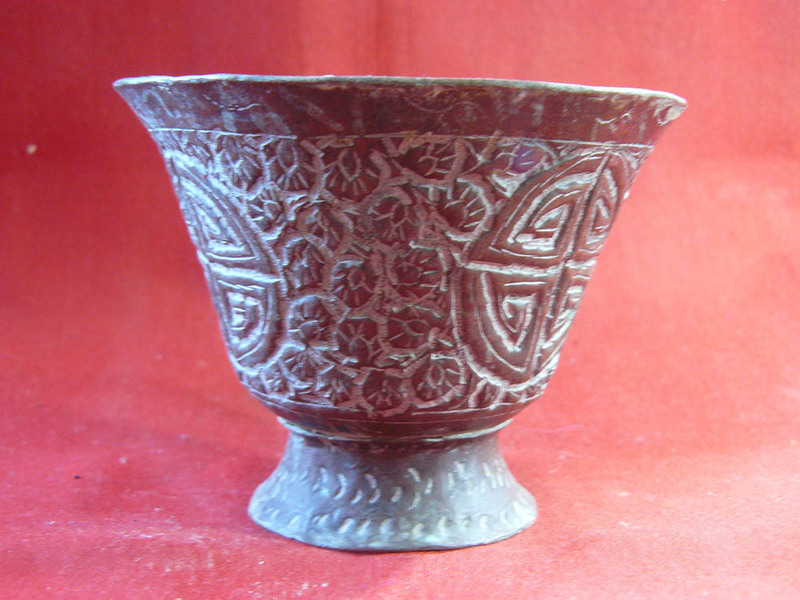 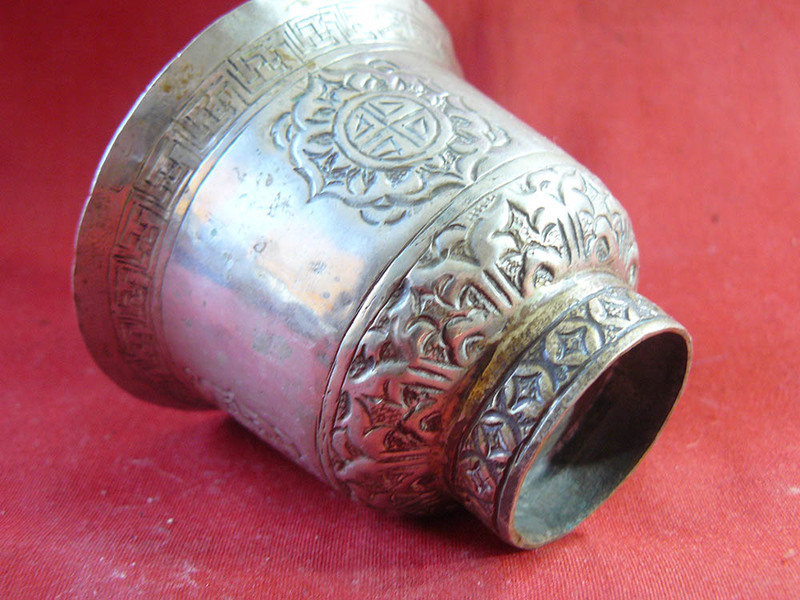 A Tibetan silver lined copper cup, well made and in good condition. 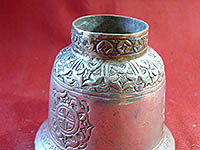 A very old bronze Tibetan cup, well made and in good condition. 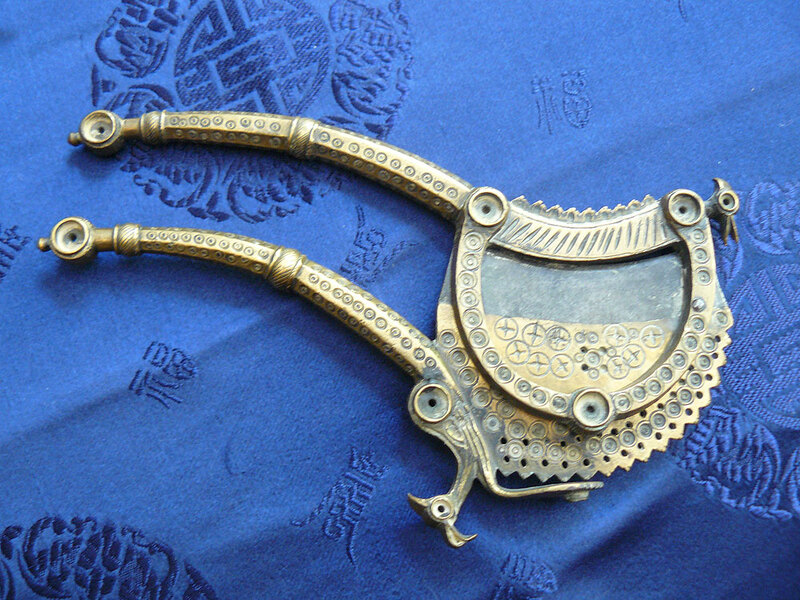 A unique and unusual object. 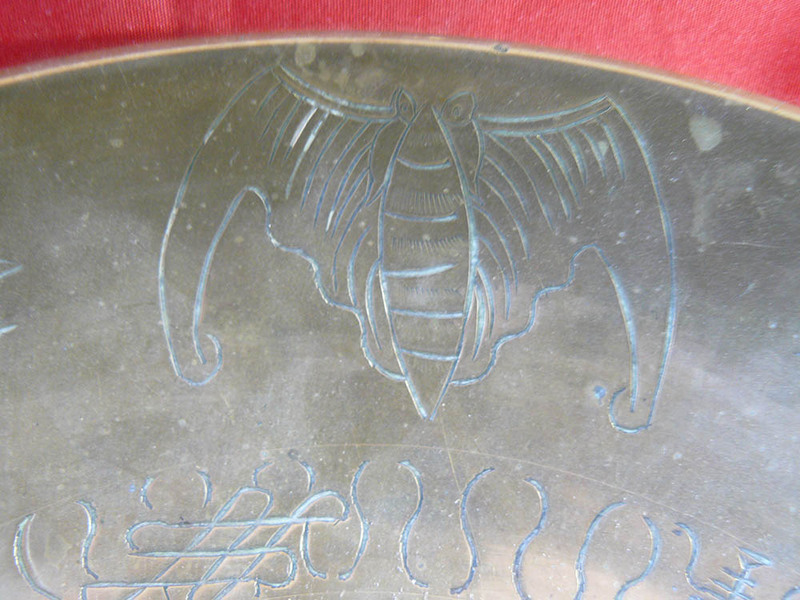 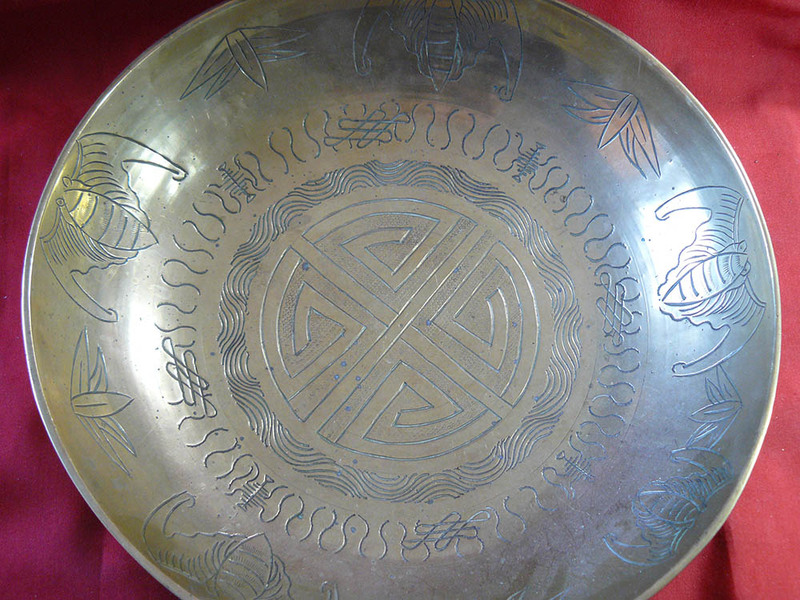 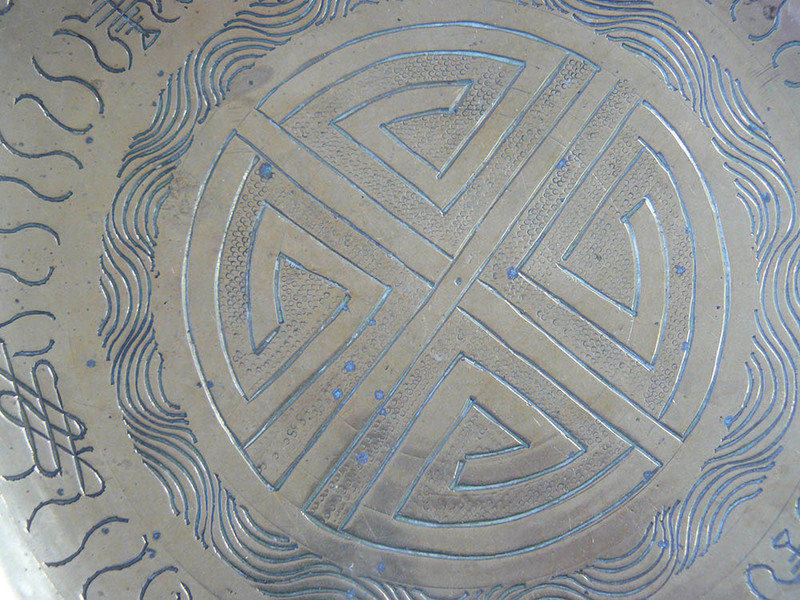 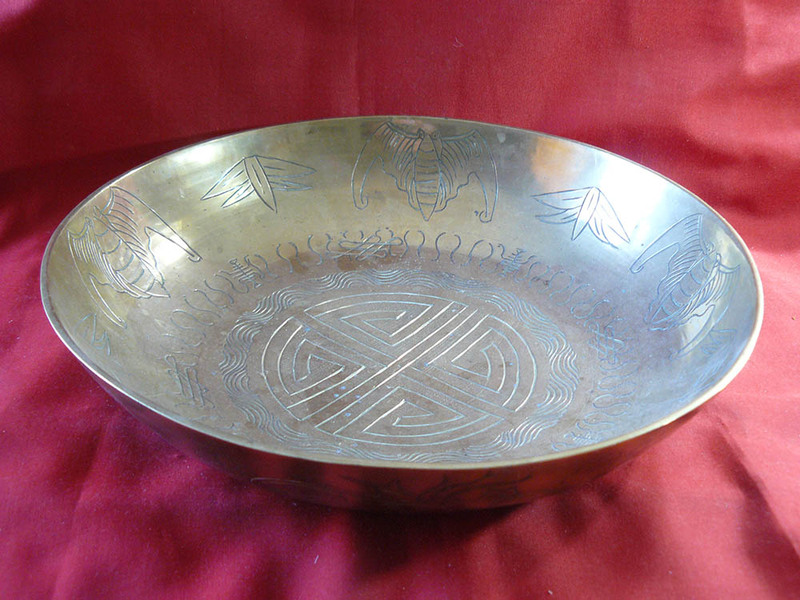 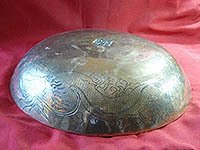 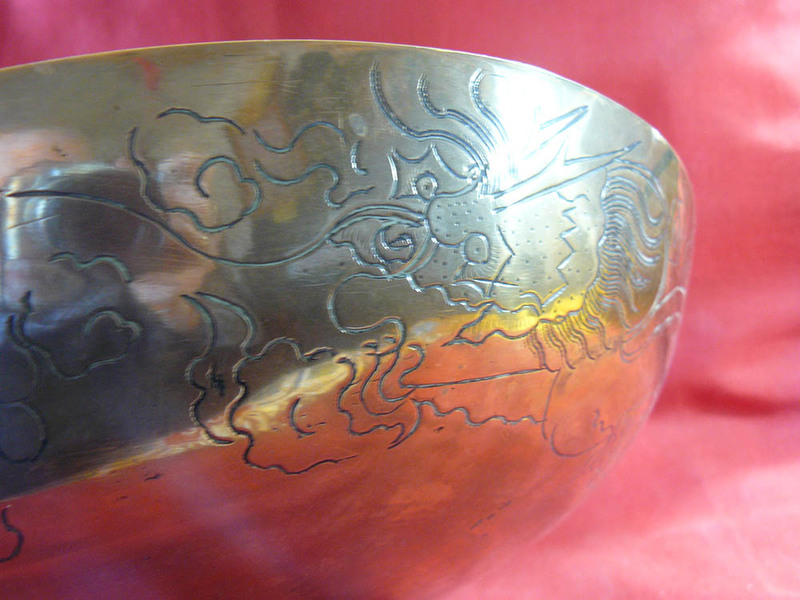 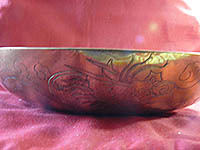 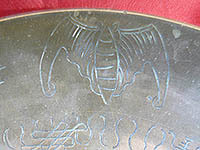 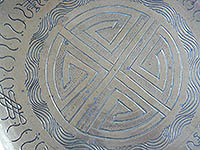 A large shallow brass chinese bowl decorated with dragons and other auspicious symbols. In nice condition. 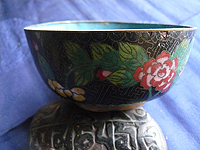 An old Chinese cloisonne bowl decorated with flowers and traditional patterns on a dark turquoise ground. 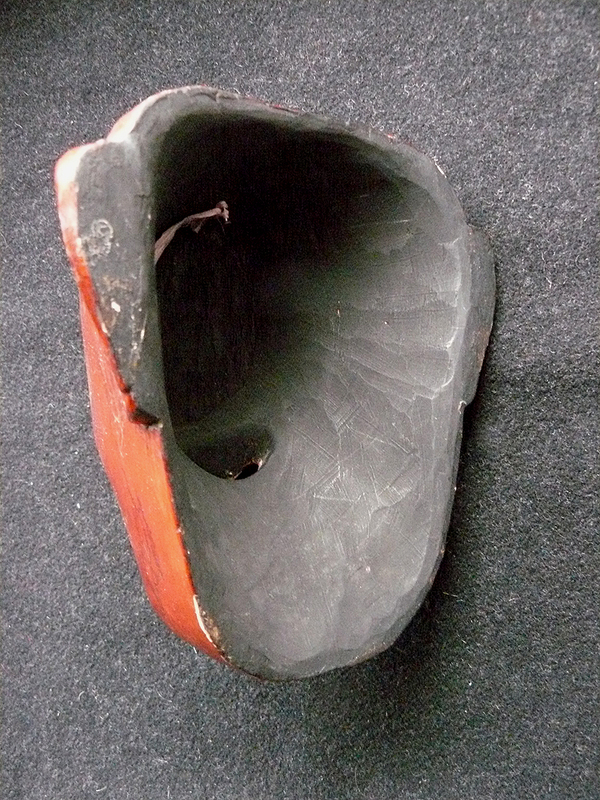 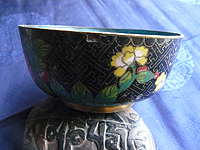 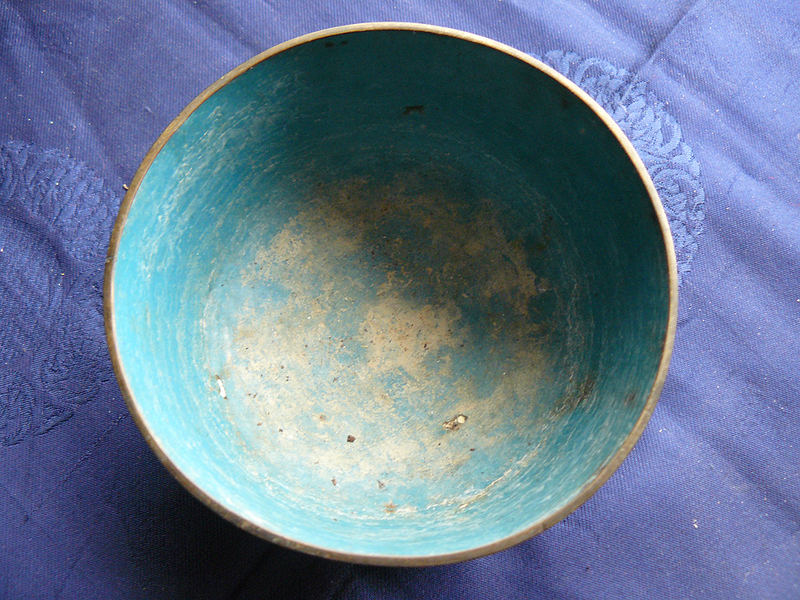 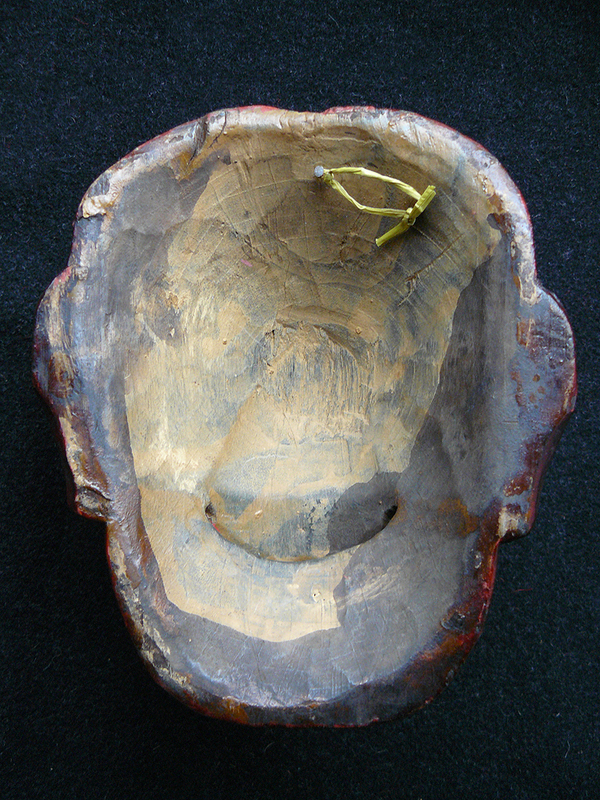 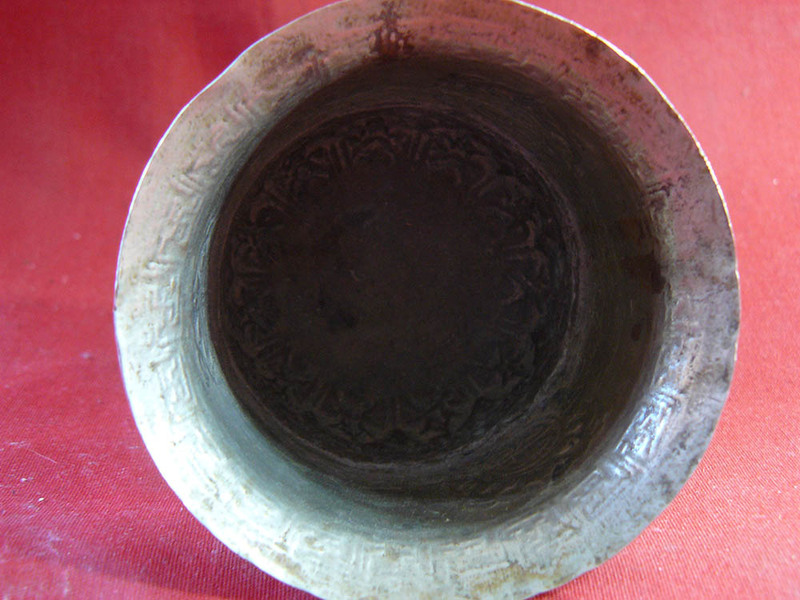 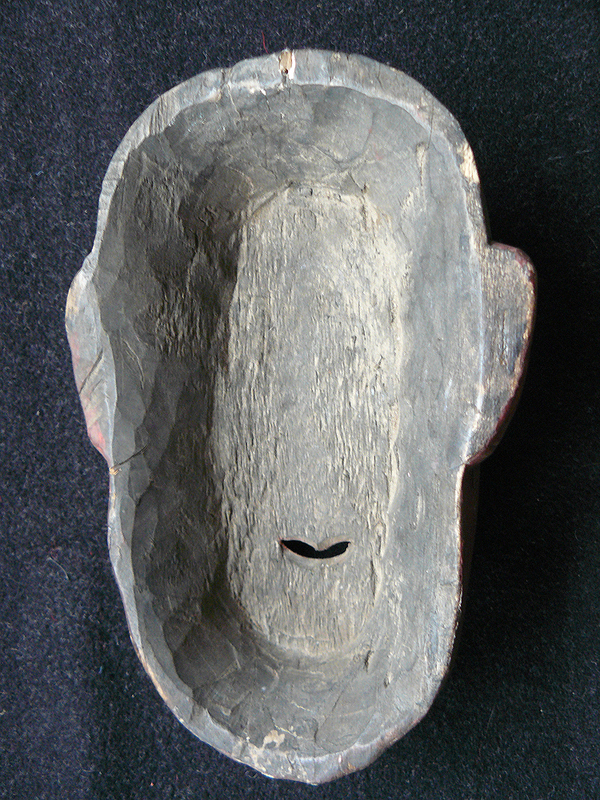 The bowl is very attractive, but it has seen some life and is not in perfect condition. 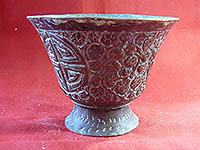 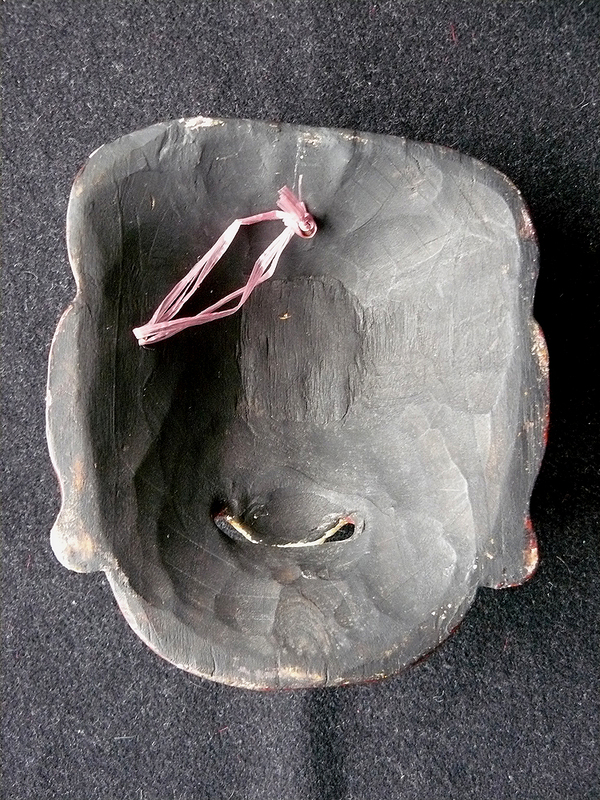 It would make very nice offering bowl on an altar, or could be used as incense bowl in the Chinese manner - putting some sand into it, in to which an incense stick is pushed. 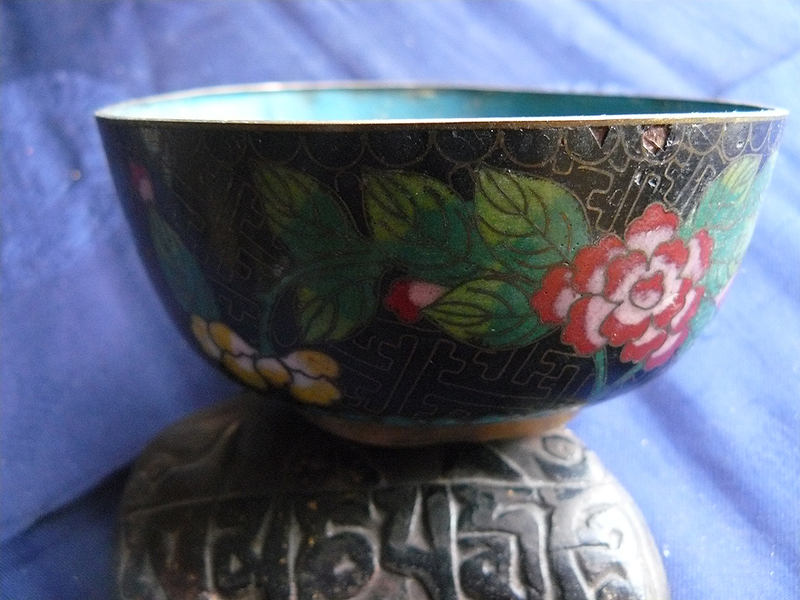 Despite its damage it is a very attractive bowl, old Chinese cloisonne is always a thing of beauty and is widely collected. 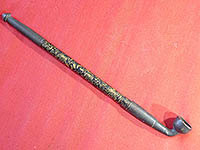 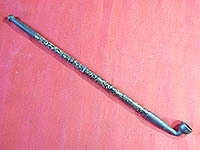 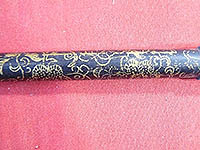 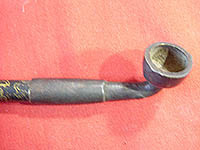 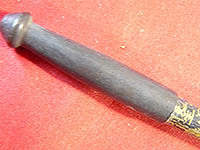 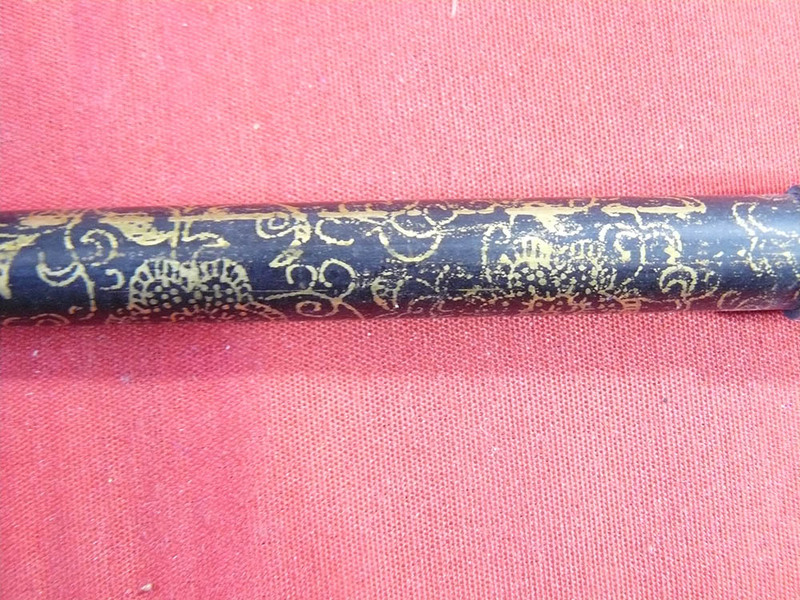 An extendable, decorated metal smoking pipe with bronze bowl and mouthpiece. 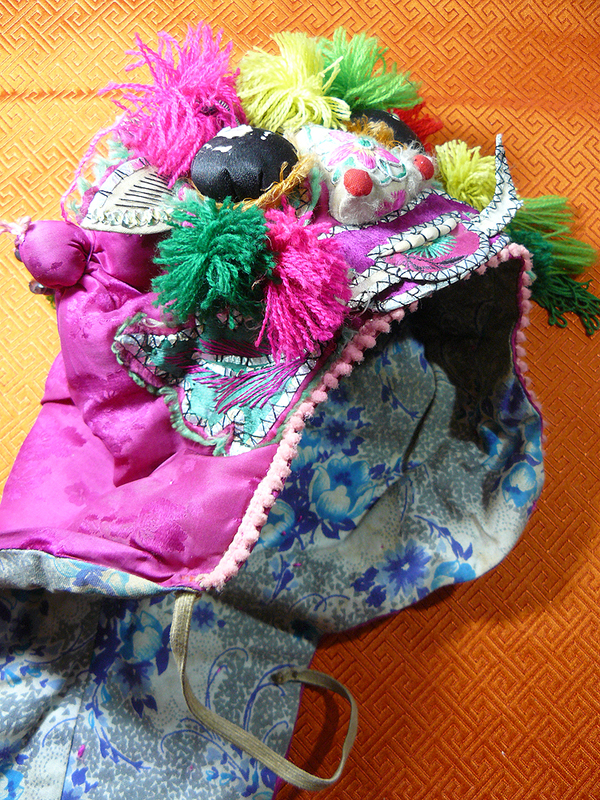 A used child's hat from China in the form of a tiger. 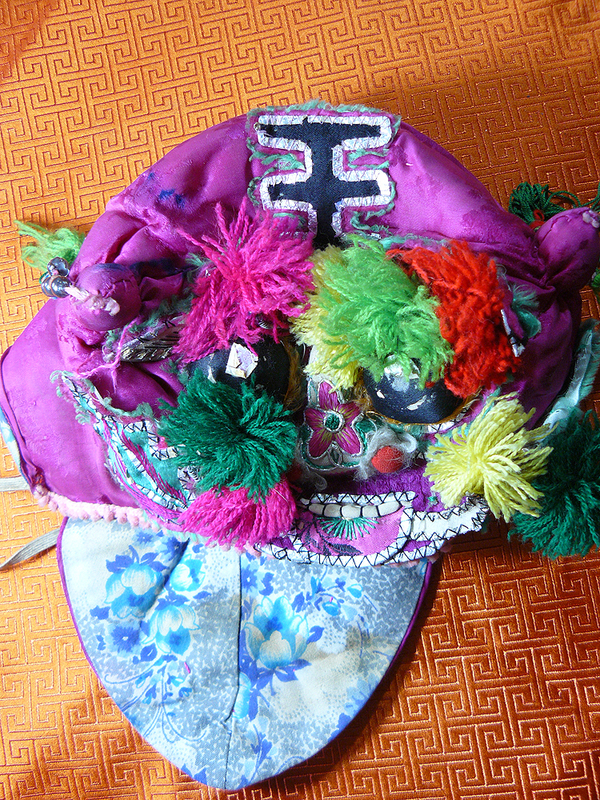 Tiger hats are worn by rural Chinese young children to protect them from the influences of hostile spirits. 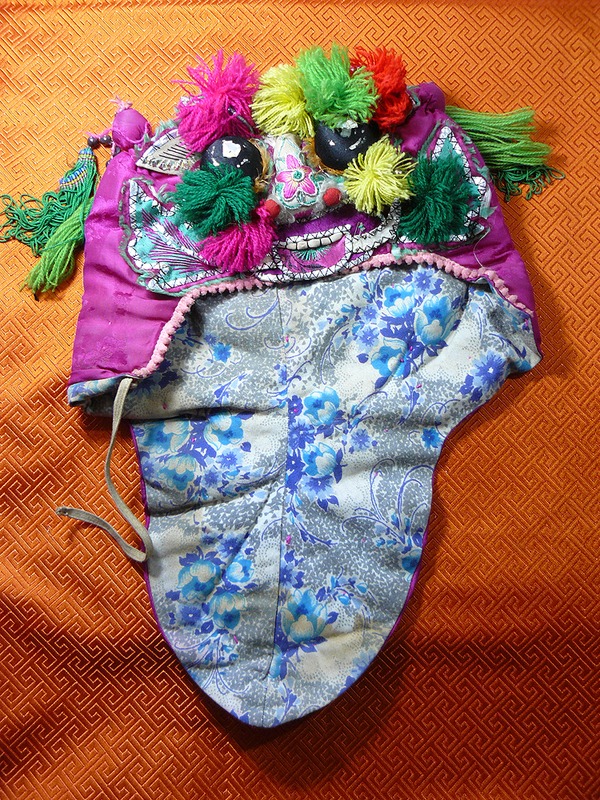 Sometimes tiger boots are also worn. 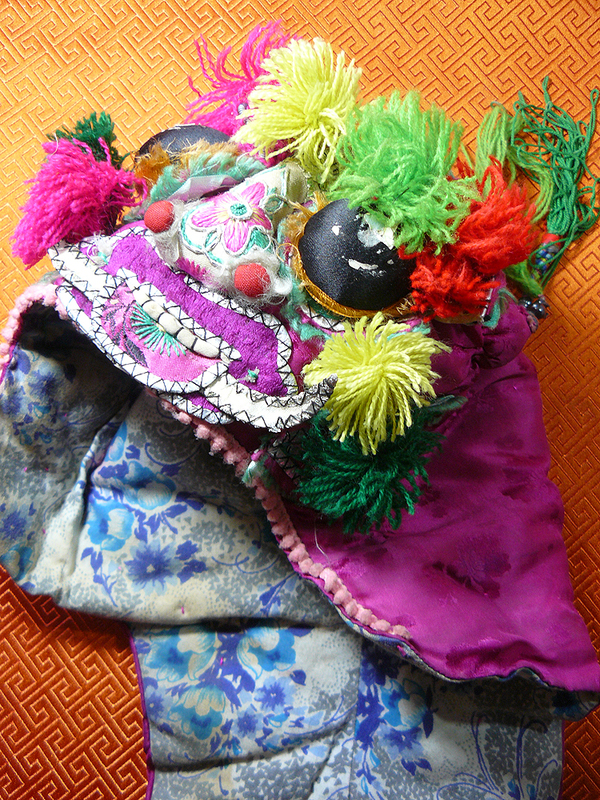 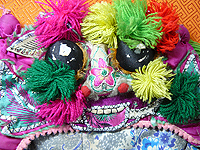 The hat is made of fabric and decorated with textile eyes and a tigers nose and teeth. 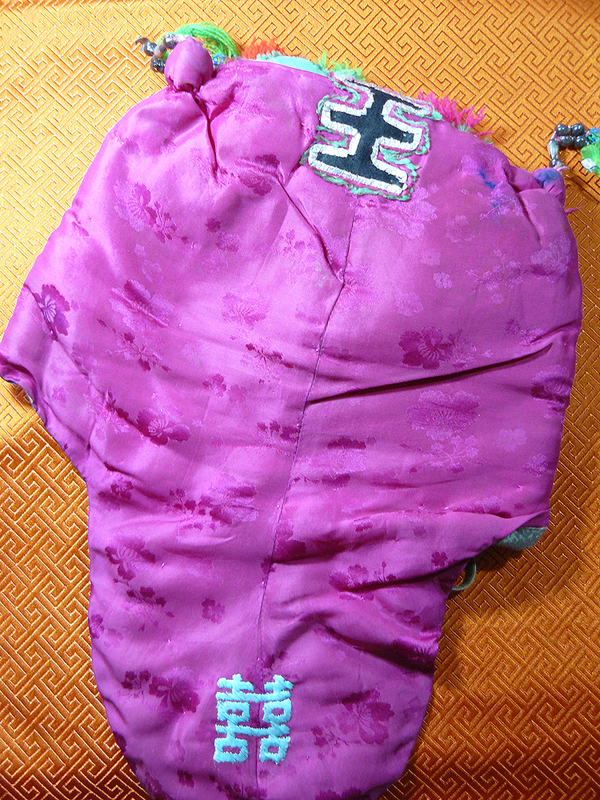 It is lined with another fabric and it has tassles with beads attached which hang from the tiger's ears. 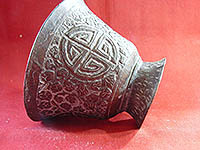 It is in good but slightly grubby condition and makes a charming item for display. 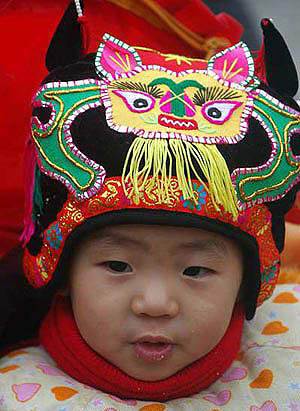 A Chinese baby in a similar new hat. An cutter for use in the preperation of betal nuts used for chewing. 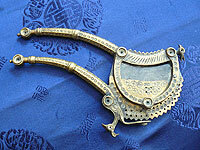 It is in good condition, made of brass with a steel blade. It is decorated with birds and patterns. 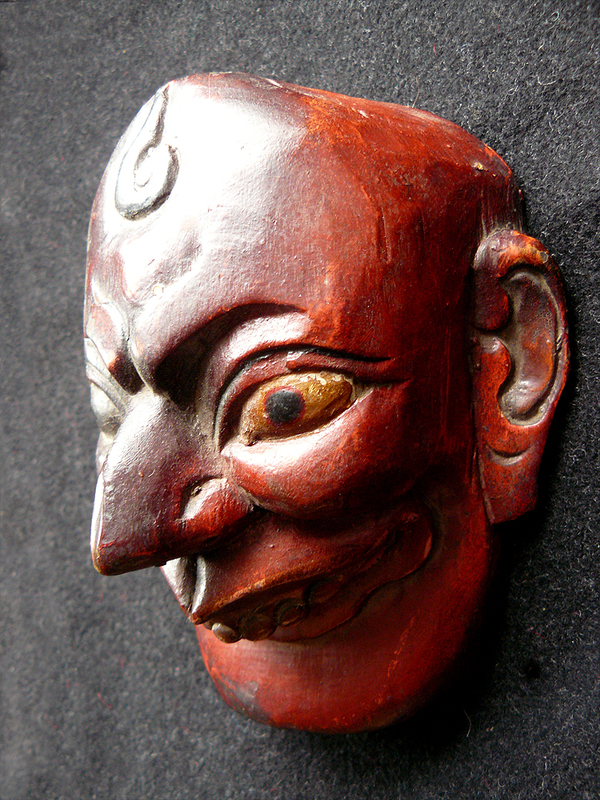 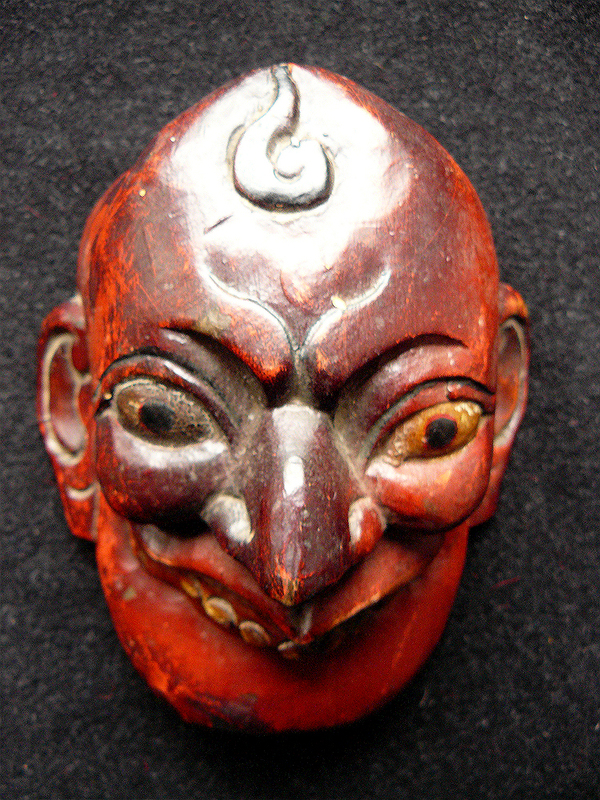 Well carved, beautiful Bhutanese face shaped forehead mask. 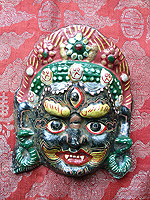 Forehead masks are not worn on the face but rather - as the name suggests - on the forehead. 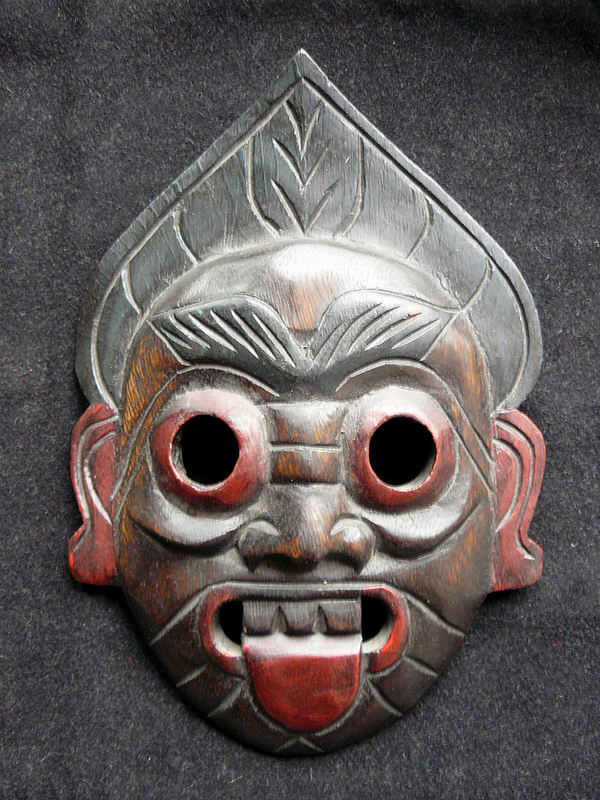 They generally dont have eye holes but often have a carved open mouth. 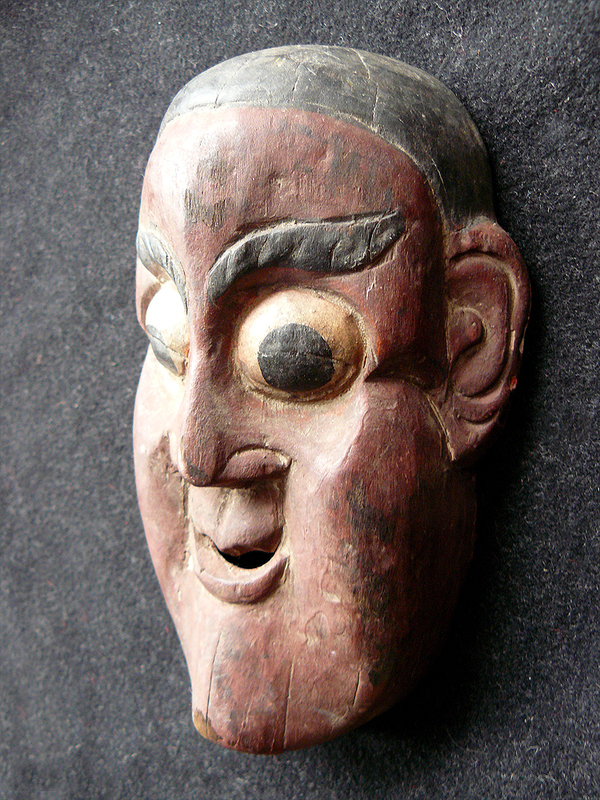 This face would be a character from a Buddhist folk tale. Masks like these make wonderful decorative objects to hang on a wall. 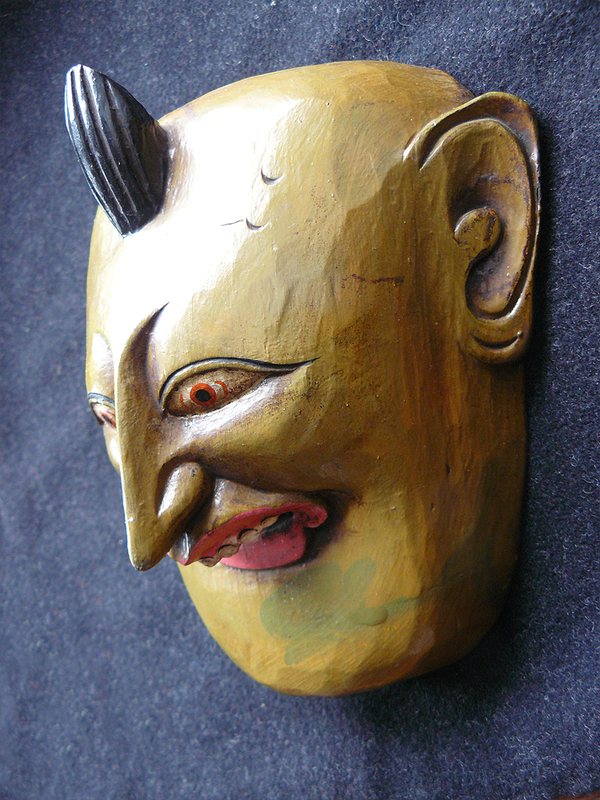 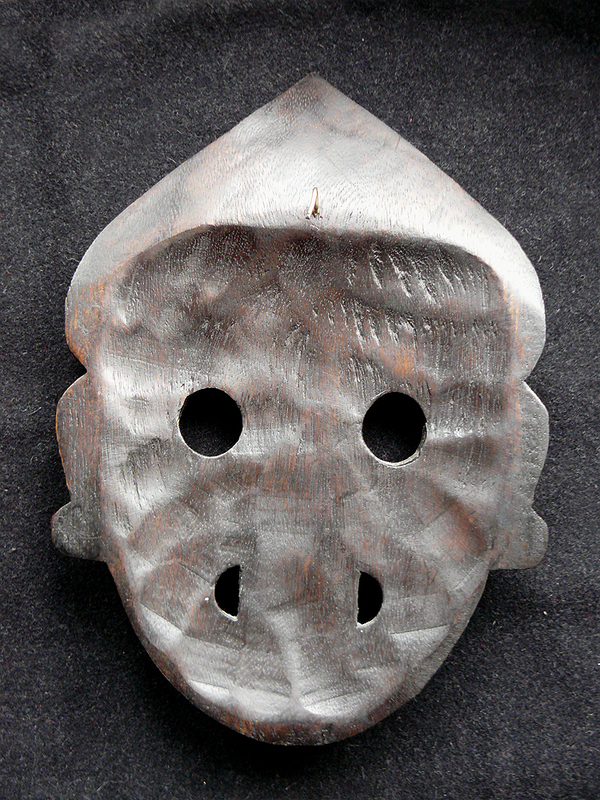 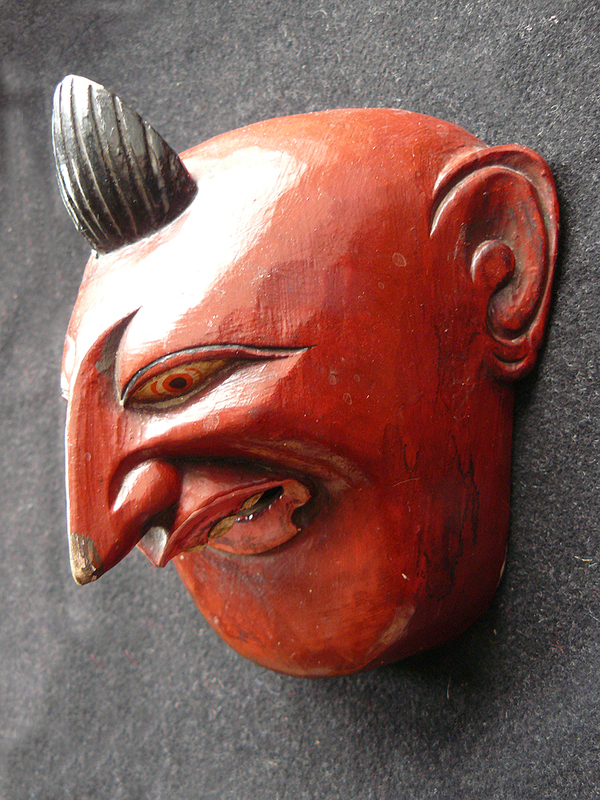 The mask is hand carved from a light, hard wood and painted. 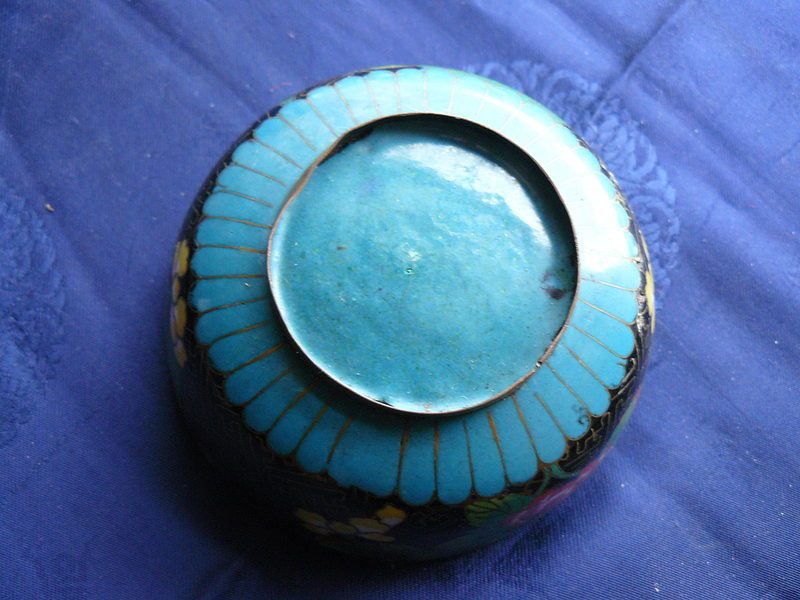 It is in good condition with no cracks. 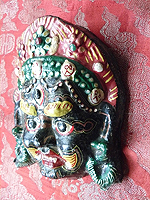 Painted papier mache Mahakala mask. 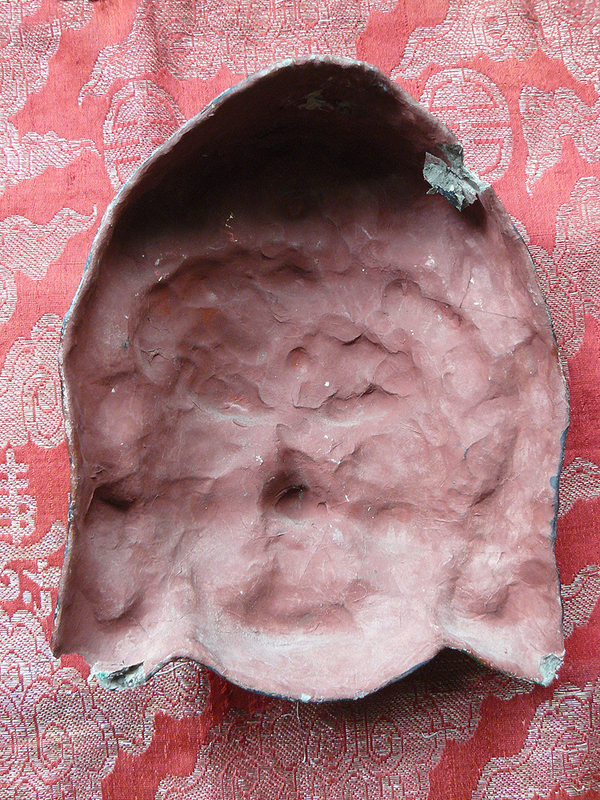 The mask has no eye holes, so is more designed for wall display. Is in generally good condition, although there is a little damage inside and around the edges in some places. 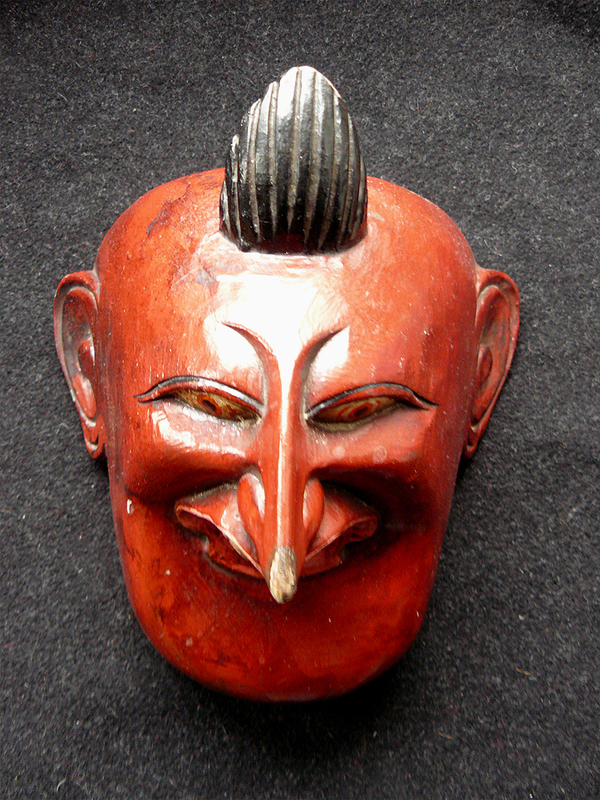 Well carved face mask from Java. 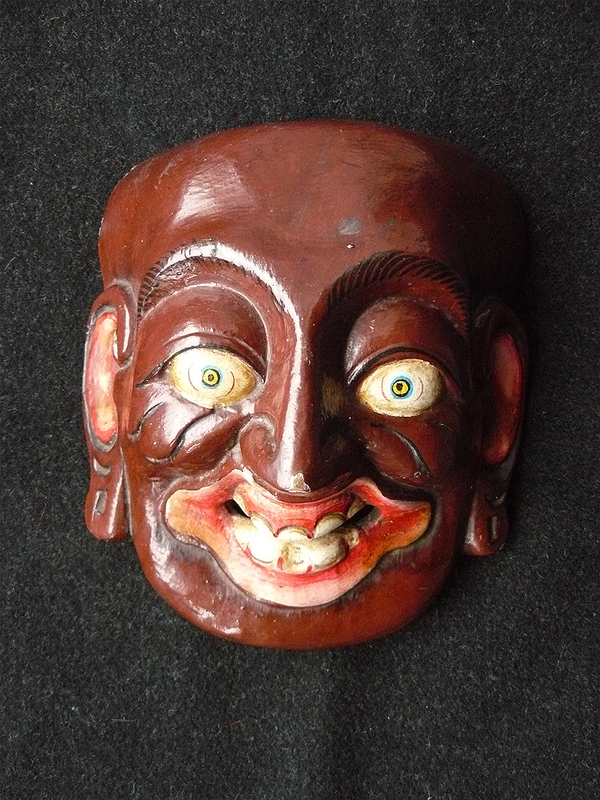 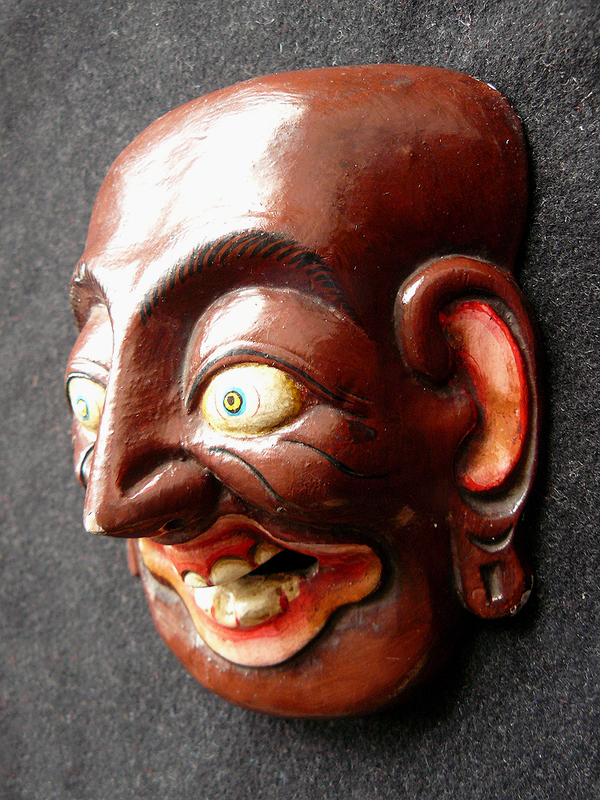 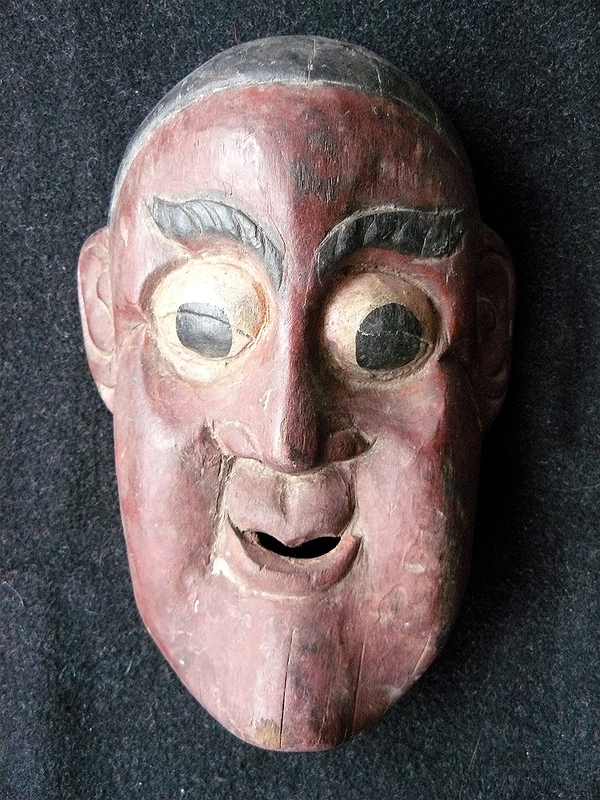 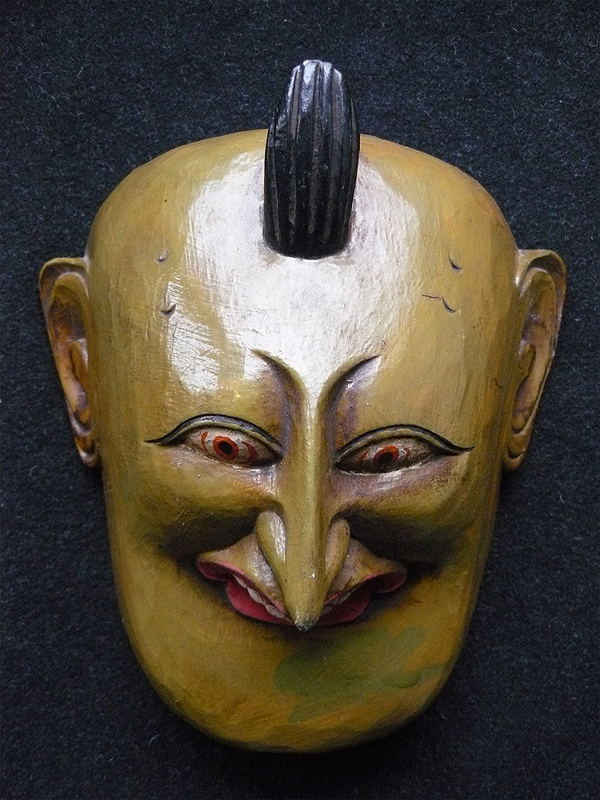 Masks like this are put up to frighten off hostile spirits, although this one has almost certainly been made for tourists..
Would make wonderful decorative objects to hang on a wall.